I’ve recently started a book club around my text on digital portfolios for students. We are currently discussing Chapter 1 in a Google+ Community, using a thought-provoking question or statement for the participants to respond to asynchronously per day. This text was referenced in a connected coaching course I took with Lani Ritter Hall a few years back. It is a very practical resource for school leaders and coaches. At less than 100 pages, I can quickly go back and find the most salient points to reference in my work with connected educators in online spaces. Here are a few of my favorite parts of the text. This is where having coaching conversations in online spaces becomes a challenge, for the obvious reasons. We cannot read body language or assume underlying emotions. It is more difficult to express ourselves in this way within this medium. What I try to do is use positive presuppositions (52). This means assuming that the other person has the best of intentions, and to respond in a manner that allows for the person to expand on their ideas. This “pulling out of their thinking” again involves making observations and asking wondering questions. One of the benefits of learning in online spaces is the spaces of silence that naturally occur, especially in asynchronous situations where time is not a factor in posts and responses. One of our teachers pointed out the benefits of silence during a prior online learning community. “When you are not expected to answer a question right away, it gives you time to thinking and reflect on possible responses.” This period of reflection can allow learners to develop smarter responses, an advantage of learning online vs. in person. There is a fine line between coaching and mentoring. 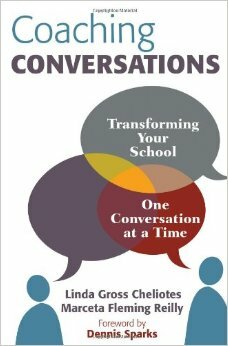 “In coaching conversations, instead of giving advice, the school leader supports her staff by paraphrasing what is said and asking powerful, open-ended questions that lead to deeper thinking” (57). Mentoring is different. A mentor gives direct advice, in fact telling the person on the other end of the conversation what he or she might want to try in their practice. I am sure there a few members in our Google+ Community that would like to be told what to do. However, it is more important that they arrive at a deeper understanding for student-centered assessment on their own terms when possible. Of course I will offer advice when asked. But I believe the best learning happens when we can build a deeper understanding together, with the learner doing the lion’s share of the work. This short animation, also shared during the Connected Coaching course with Lani Ritter Hall, nicely sums up this concept for me of coaching and learning in online spaces. You’re welcome Cathy. Your book study on Digital Reading by Franki Sibberson looks excellent. I wanted to join you all, but with my club going, I didn’t want to take on too much. In our book club, one person asked when mentoring would be advisable. I replied when working with novice teachers, whether beginning or veteran, with the goal of getting them to proficiency. Definitely some application here to teachers working with students. On Thursday I plan on posting a follow up to this post, about a strategy/mnemonic device I use when giving feedback in online and in-person coaching conversations. Until then!